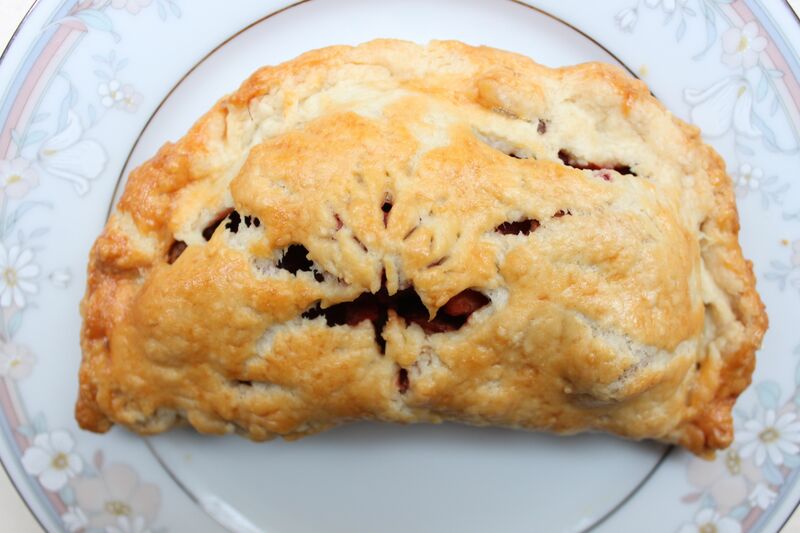 A pork and beet pasty inspired by Neil Gaiman’s American Gods, part one (or pie one) of a two-pie special! American Gods is probably one of my favorite books of all time, one that needs little to no introduction due to its immense popularity and ravenous cult following. When I met Neil Gaiman on the train about a year ago, I mentioned wanting to do this as a pie one day. If memory serves, he seemed a little bit dubious (and very rightly so) that a single pie would be enough. So I’m making two. A few days before he’s released from prison, Shadow finds out that his wife has been killed in a car crash. Essentially homeless, jobless, and without any reason to stick around after Laura’s funeral, Shadow finds himself in the employ of a mysterious Mr. Wednesday. Suddenly Shadow has inadvertently been implicated in a supernatural war for the spiritual soul of America. The gods and goddesses of folklore are real, immigrants carried them to the new world and sacrificed to their honor on american soil. And now they are trapped in a country that no longer believes in them, hunted by a rising of new Gods for the digital age. I love myths, legends, and folklore. American Gods is an extremely skillful continuation of those ancient stories most integral to our cultural consciousness, both as a global community and on a regional basis. It’s an American odyssey. It kneads these powerful characters into this hyper-Americanized (and yet not inaccurate) setting. Every time they stop at a burger joint, drive for days on end through grey country, or stay in a dingy motel it plays on the American ideal, without denying its gritty (and often depressing) reality. The people in Lakeside, with their community concerns and friendliness, remind me so much of Rotary pancake breakfasts in Ohio it hurts. (There’s actually a small town in Ohio called Lakeside that our family visited for a week or so a few summers when I was a kid). At times Gaiman seems to subvert his own voice in this piece, almost in service of his story and the stories to which he’s paying homage. The book has weight and importance, and a subtle yet strong aesthetic greased into its joints; to me it reads as more than the sum of its parts. It is more than its author, more than its readers, invoking characters who have been garnering an audience’s admiration and sympathy longer than any of us have been alive. I labored under how to approach this book, with its vast and varied flavors. In the end, I decided to focus on the juxtaposition between old and new. While this doesn’t encompass the many nuanced aspects of the book – each god representing a different country, region, or system of belief provides yet another flavor to the story – I tried to get at the dichotomy at its heart. Much like the pantheon in the book, although America is a collage of other cultures to begin with, it was almost impossible for me to satisfactorily combine my ideas and ingredients to represent the established older gods with those for the new. Which is how I came up with the idea for a double feature. This old gods’ pie comes in the convenient form of a savory hand pie, called a pasty. They are mentioned repeatedly as being the main draw of the diner in Lakeside, they’re a “yuppie” thing. Although pasties are originally Cornish, growing up in the midwest (where yuppie equals U.P. equals upper peninsula Michigan) it wasn’t hard to come by a pasty if you wanted one. The story (as I’ve heard it) is that miners used to take them to work as their lunch, hot out of the oven, tucked inside their inner jacket pockets. The pasty keeps you warm until it’s time to eat it, then you just hold it by the crust and nibble, no silverware required. Inspired primarily by Czernobog and the Zoryas, I consulted recipes for borscht, stuffed cabbage, and other earthy Eastern European/Russian foods. I wanted the insides to be beet red and bloody-colored, much like the gristly offerings the old gods’ prefer in the book; a powerful and hearty meal. I seasoned it with salt, pepper, paprika (my favorite), dill, and finally a dash of allspice for the allfather. Combine the flour, butter, water, and cider vinegar in a large bowl and cut together into a shaggy dough. Use your hands to knead it into a ball, set aside, and refrigerate. In a large skillet (I use my bigass cast iron), melt a few tablespoons of butter over medium heat and brown the garlic. Add the beats potatoes, carrots, and celery and cook in butter until softened. To brown and seal the pork, I usually push all the veggies to one side temporarily and use half of the skillet as a grill, then I combine them all together. Pour out the tomatoes and sprinkle the cabbage over top, mix it in. Were I to do this again I would probably add a bit of vegetable broth to keep the innards a bit more soft and tender. Add the paprika, bay leaves, allspice, salt, and pepper, cover, and allow to cook for roughly 15 minutes. I usually remove the lid and allow it to cook down further, to about half liquid when then meat is soft and tender. Add the dill for the last bit of boiling. Ideally you should let the filling cool to almost room temperature (if not cooler) before assembly, otherwise the butter in the crust will melt and everything will be awful. After rolling out the dough (repeatedly, in many cases), I used the rim of an upturned bowl and a knife to cut out rounds about six inches in diameter. Add about 1/3 of a cup of filling, perhaps a bit more, so that it occupies one half of the circle with about a half an inch at the edge. Fold the loose half over top and roll the edge in back towards you. Repeat a dizzying number of times until you have a dozen pasties. Slit the top of the pasties (I attempted a yggdrasil/tree design, with little success) to ventilate, brush with beaten egg to give them a lovely golden brown sheen as they bake, and pop them in the oven on a baking sheet for approximately 25-30 minutes or until golden brown. These puppies are best served warm and eaten on the go, potentially at a highway truck stop somewhere in middle america while a cold wind rattles through barren cornstalks on a grey afternoon as your employer hits on the woman working the gas station counter. This reminded me that I have always wanted to make a meal based upon the Endless from the Sandman comics. Superb idea, and pie! I had to alter some elements – mainly because I can’t eat wheat, but it turned out pretty great. Gluten-free crust that actually does what you want it to is hard to make. 😛 Definitely going to make this again, probably for the holidays. How did you make the crust? Always interested in gluten free options for friends! Superb idea, and pie! I had just finished reading American Gods too! I had to alter some elements – mainly because I can’t eat wheat, but it turned out pretty great. Gluten-free crust that actually does what you want it to is hard to make, but I’m definitely going to make this again, probably for the holidays.